I was delightfully surprised by this wonderful collection of short stories, each an original and inventive gem. Collini is a marvelous writer, a great storyteller with a keen eye for human foibles, yet always with empathy for the human condition to which we are all heir. 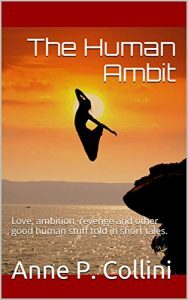 Collini’s evocative prose was filled with fantastic verbs and unusual phrases that made every scene leap from the page. She wrote using several points of view and with pitch-perfect deftness of different eras, diverse dialects and ethnicities yet always encircling the human heart, even when it was beating in an android shell. There were laugh-out-loud stories and others that tore at your heartstrings, but always capturing with humor and pathos the human heart crying out to be seen and acknowledged. I would love to see these stories expanded. The characters charmed, amused or tore at our hearts: in Silver and Gold, a boy with uncaring parents became a man without a moral compass, his collision with fate inevitable; in Twitty Jenny, the breaking heart of a mother who could not “own” her child, and the poignant moment of her liberation. Collini painted characters with sweeping brushstrokes that crackled with humanity, capturing the essence of emotions, moods, and situations. A thread ran throughout of the redemptive spirit, of people who refused to lay down their humanity, and the need for love and connection. I love her strong women, whether a runaway slave, a lovelorn android, or a free-spirited 17th century artist. I could almost feel a conspiratorial wink from Collini to the reader. There were so many phrases I loved: “I peered into my tankard, the grave of my care” in The Prince of Meander; “born tore-down poor” in Silver and Gold; “A friend like that, who turns you back to the laughter when you don’t feel like laughing, is the very best gift of all” in Circus Maximus. There is the dark side too: revenge, anger, some of the stories with a shocking twist at the end, as in Red, Bloodless World. This is storytelling at its finest. I have recommended this book to friends and I know I will re-read stories from this delightful collection.